Sip is an upscale bar nestled in the heart of VI. The decor is absolutely gorgeous and the crowd is cool. Its main problem is the entrance. If you want to truly feel like a nobody in Lagos, try getting into Sip on a Friday night without knowing someone on the inside. I was in shock one day when my friends got there before me and I literally had to STRUGGLE to get in. There were people smashing into each other, begging the ginormous bouncers to let them in. I had to move back so as not to disgrace my family there. It’s funny because in the middle of the people struggling, a guy from a “big Lagos family” walked up and the bouncers literally cleared the tight crowd to let him in. I just put on my cool face and walked in behind him, wondering where my shame had gone and praying the bouncers wouldn’t embarrass me. The cocktails aren’t ridiculously expensive for an upscale bar in Lagos. 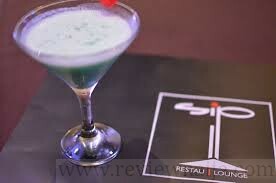 N1500 should get you a regular frozen margarita and for N300 more you can add one of three different flavors. They also have other pretty exotic cocktails (I had a caipirinha) and their bottle prices are standard. PROS – Gorgeous crowd, beautiful decor, and awesome DJ. CONS – Getting in (on Friday nights), tight space, and horribly smelling toilet right beside the “VIP” area (nothing really VIP about it in my opinion). Soooo I carried my big head to Sip last week Saturday and I’ve decided I won’t be visiting again (unless there’s an event I’m going for). This review, though written 3 years ago, is soooo accurateeee! The struggle to get in was so real! We eventually did get in and there was no space to dance and it was pretty hot. So we just decided to chill outside and get shawarma from paris deli. The shawarma was actually decent but toooo spicy…gave me the runs in the morning. Anyway, my Sip days are over shaaaa…. This is literally the funniest thing I’ve read in a read all month! Had me in stitches! This place tends to be ridiculously packed! During the 2012 Xmas hols they were using tasers mmmm club is not by force!